Art & Beyond Publications is launching a newly updated web site with extended artist�s opportunities designed to help artist promote themselves through Art & Beyond Publications. Please follow the link to our new website http://www.artandbeyondpublications.com and be the first to apply and get published in the May/June Online Magazine. The E-Newsletters will be going out to galleries in the first week of June. Learn about the Membership and how it may improve your artistic goals and the additional benefits you can receive by becoming a member. 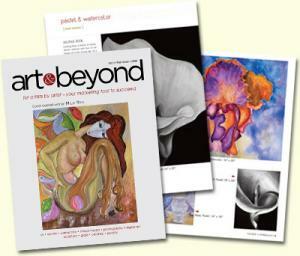 All artists published in any of the Art & Beyond Publications will have additional exposure in the Online Gallery. Check the �Books page� of our website for an additional opportunities to compete and be published in the 2011 collector book series "Best Living Artists of Today". Don't miss this amazing opportunity brought to you by Art & Beyond Publications, to have your artwork seen by thousands of galleries and other art institutions. This of course made it almost impossible for an artist to break through the doors within the industry on an artists� own behalf. Even if an artist was still given the chance to send a portfolio for review, promises from a gallery such as �we�ll contact you in the near future� often never came to fruition. Your work was thus stored in a file cabinet from that point on and was either never reviewed or even looked at ever again. Quite the opposite was true for an artist who had been represented by an art dealer or agent or was discovered in the pages of an art magazines. Everyone can agree that there is no fairness in these situations. Although it is understandable that a well established gallery must strive to discover something new, innovative and unique; it doesn�t help those artists whose work that has been placed in a various file cabinets for months or even years with little to no chance of being considered in the future. If you are a working artist, who thus constantly creates new works that are ready to sell at that time, you become a part of the vicious cycle of testing your luck with galleries again and again with the same disappointing results. So, I asked myself again, �What is the solution to the dilemma that thousands of artists face daily?� This question made me realize that I can help artists without a voice, who don�t have an agent, dealer, or even a publicist to present their work to art galleries, art museums or publishers. marketing tool in the form of Art & Beyond with the sole purpose to help artists expose themselves to art galleries, art museums and publishers.